At the time of writing, the debt ceiling negotiations in the United States are in a state of flux. One idea that has been floating around is that the U.S. should just let the debt limit kick in, and have a “cold turkey” balanced budget. In other words, cut back spending to match taxes as they come in, so the amount of debt outstanding does not rise. As the chart above shows, even if such a policy was operationally possible (which I doubt), it would not merely be bad, it would be a disaster. 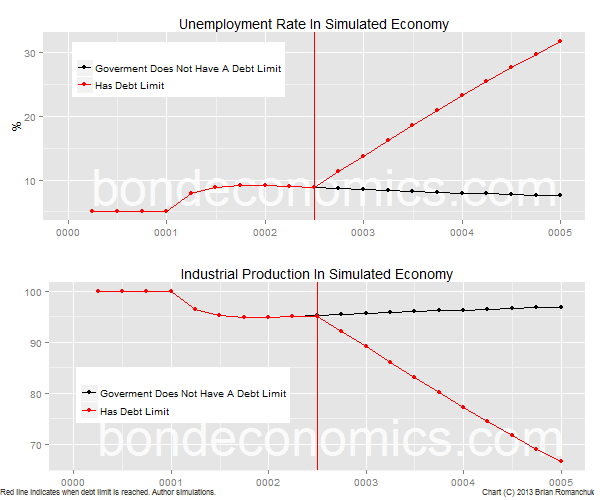 To explain these charts: they shows economic variables for a simulated economy (using a simple Stock-Flow Consistent (SFC) model I developed). The economy starts off in a steady state, with an unemployment rate of 5%. After one year (“year 0001”), a recession hits, and the unemployment rate rises. The stabilising effects of the welfare state kick in, and the economy slowly mends. The unemployment rate falls steadily, reminiscent of the recent observed behaviour of the United States. However, in the second quarter of the second simulated year, government debt hits an arbitrary limit. The black line shows that steady improvement continues if that limit is ignored. The red line shows what happens if the government debt is capped at that limit - industrial production falls further, and the unemployment rate turns straight up. And unlike the behaviour after the initial recession, there is no tendency for the economy to return to its initial level of unemployment. The reasoning for the collapse is straightforward: enforcing a debt limit (by keeping government expenditures in line with taxes in each time period) essentially turns off the stabilising effect of the welfare state. Hyman Minsky underlined the stabilising effect of “Big Government”; and without it, we return to the world of the 1800s, where 20-30% declines in GDP were common occurrences. Such a policy is even more extreme than the rather foolish austerity policies followed in Europe. The Europeans at least only attempted to control planned spending, but did allow welfare state policies to continue. This is why they have been continuously “surprised” that they missed their fiscal ratio targets, but at least some economies (like Ireland) have stabilised – albeit with unacceptably high unemployment rates. To be clear, this model is a simplified teaching model, of the type discussed by Nick Edmonds in this article. If the U.S. did switch to attempting to balance its budget in response to debt limit problems, the collapse would be more rapid and more destructive than these simulation. My model, like many mainstream models, does not have a financial sector. In the real world, bankers as well as corporate equity and bond investors would be able to forecast the economic collapse. In response, they would pull financing from the nonfinancial sector immediately. Like in 2008, the economy would go into rapid freefall, except this time the government would be powerless to stop the collapse. As such, I would underline that these simulations do not represent my forecast – in the worst case, the financial collapse would almost certainly overwhelm the Tea Party faction, and the debt limit would be raised rapidly. A short interruption in spending (two weeks or less, say) - and which is expected to remain short - should not be enough to cause much more damage than a “normal” recession. Since the financial markets will not accelerate things, the slow-paced real economy effects of interrupted flows will only amount to a percent or two of GDP. As Steve Randy Waldman suggests, the financial sector could extract rents via discounting Federal government payments, allowing income flows to continue (after the flows suffer a haircut). Returning to the simulated world, we see that austerity is self-defeating, if the objective is to improve the “creditworthiness” of the government (not that such a concept makes sense for a sovereign that borrows in a fiat currency). 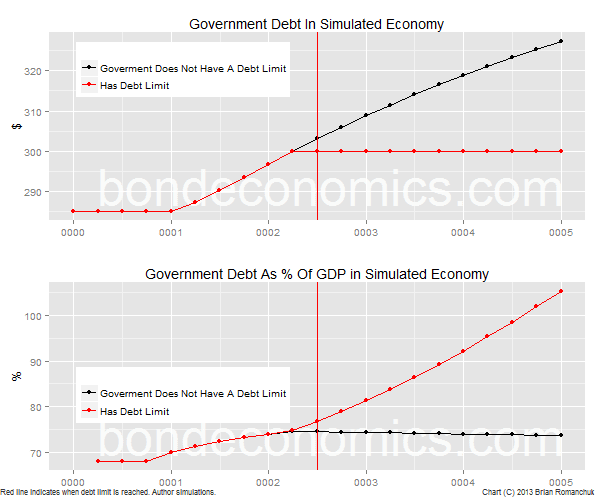 As the chart below shows, although the debt level is lower in absolute terms if the debt cap is respected, the debt level explodes relative to the size of the model economy. I do not wish to dump all of the details of the mathematics of the simulation in this blog post. I will be happy to offer more details in response to comments. But I do wish to offer more details on why the model economy “melts down”. The driving mechanism is the problems faced by the business sector. 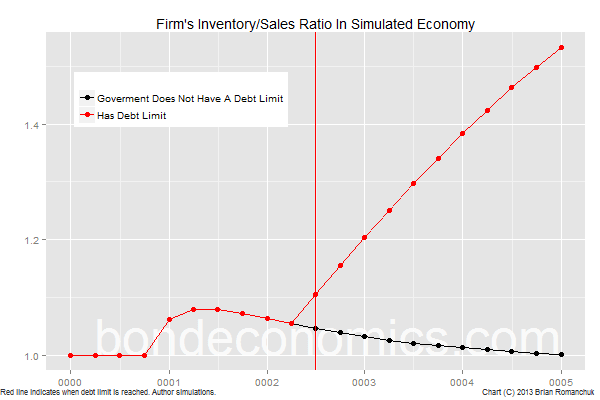 As the chart above shows, the business sector inventory/sales ratio starts out at 1; this is where the model business decision makers want that ratio to be. (This is an example of a “stock-flow norm” as used in the SFC literature, businesses want inventory (a stock variable) to remain at a fixed target ratio to sales (a flow variable).) The business sector reacts to the rise in the ratio by attempting to drop production below the previous sales level (they expect that sales in the current period will equal the sales in the previous period). To do this, they lay off workers, which drops demand further. When the debt limit is reached, this cycle continues indefinitely. Instead of fixed investment driving the downturn, which is a more normal state of affairs, it is inventory investment that drives the cycle within this model. In conclusion, a forced moved to a hard balanced budget constraint would cause a disruption that would be “off-the-charts” relative to post-World War II experience; you would have to look at the depressions of the nineteenth century for precedents. Quite agree, but you’re playing into the hands of your opponents by continuously using the word “debt”. That word has negative overtones: bankruptcy, bailiffs, etc. And 99% of the population are swayed by inuendo and soundbites, rather than by reason. Sure, I'll take a look. But to be clear, I want to keep my posts short and tightly focused; my natural tendency is to add millions of technical digressions that will just confuse the reader. In this case, since I am referring to debt ceilings, I kept the terminology used uniform. In fact, within the model, the government "debt" is actually the negative of non-government "Cash"; i.e., it is the non-financial net assets of the non-government sector. I have a small audience on this blog, and I do not know whether they are familiar with MMT-style terminology. And I have to be careful with my text and charts. If I put out a chart that was interpreted as saying that the flow of savings in a period was more than 100% of GDP, the chart could go viral in a bad way. It's interesting to see the effect on the debt/ GDP ratio. That's the sort of thing where this type of model is really helpful to bring out the full dynamics.